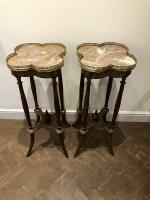 A pair of Louis XVI Style mahogany and ormolu marble top side tables with brass gallery. 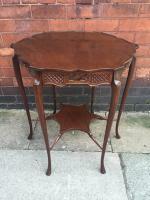 Dated C1900. 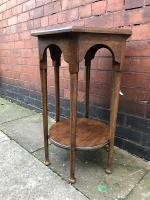 A hexagonal oak side table C1910. 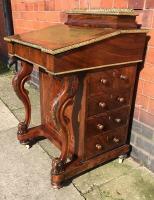 A fantastic quality davenport desk constructed from walnut with ormolu mounts and satinwood crossbanding. C1860. Has a row of dummy drawers down one side with the other having real drawers. 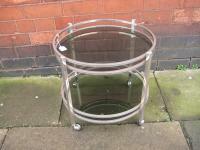 Stunning quality. 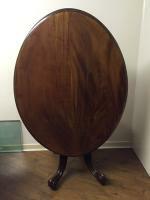 An early tilt top table constructed of solid mahogany in excellent condition. C1820. 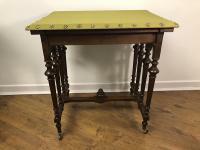 The rear legs pivot out and the top folds over so the table doubles in size. 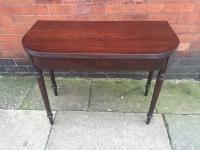 An oak envelope card table C1900 in superb condition. 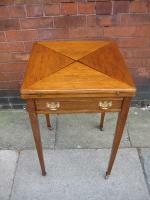 The top opens and twists to reveal a baize for cards. 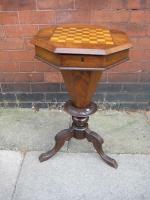 A Victorian walnut octagonal work/games table C1880.